Images by Ed Ng Photogrpaphy unless otherwise noted. Wednesday morning my write-ups from the day before went quickly, so I was able to do some prep for what lay ahead. With a huge line-up of 20 shows coming today at Vancouver Fashion Week (VFW) - Lasalle College (7 look collections by 5 students), 8 Vancouver based runway shows and 7 shows from Canada, the U.S and international locations - I wanted to be able to relax and enjoy the creativity these designers offered. Symone Says - wearing Designer Doll Fashions by DK - again led the crowd through a great evening of shows, keeping the energy high. And the runway was always filled during breaks with excited, well-dressed attendees snapping pictures and sharing comments about their favourite looks on the runway. Today I finally pulled out a cherished top I have had waiting for the right moment for a few years. To wear something from a artist you have interviewed and respect is a real high for me. I had struggled to figure out how I wanted to style it. Finally I decided to go with what I'm calling my international look. Shot on my little camera! The shirt is by Michail Gkinis of Aptform who showed on the VFW runway in Oct. 2012 (review HERE). He was born in Greece, trained in London, interned in Japan under Issey Miyake and since 2006 has based his studio in Japan. What an honour to wear it this day. I paired it with a hand-painted African themed bracelet from the Project H Shop in Holt Renfrew Vancouver, a pair of hand painted bottle cap earrings from Africa and although you can't see it here - a black skirt by JAC that sells both in Canada and across Asia. Last but not least was a pair of red heels to mirror the touches of red in my earrings and bracelet (not obvious in the photo to the left). A reminder - all local designers will be featured in my Shop Local column that I will add to as quickly as possible. Tuesday's designers just went live this morning. 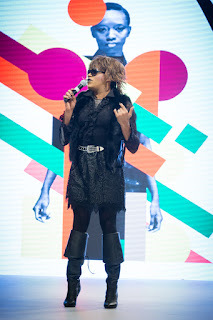 The Lasalle College student show - produced by fashion stylist Tracey Pincott. professional models from Lizbell Agency, music from students at the Sarah McLachlan School of Music (SOM) and technical work by Nimbus School of Recording and Media - will also be featured in a separate column. Toronto-based Lesley Hampton is a First Nation wearable artist and a graduate of the Honours Bachelor of Arts degree program between University of Toronto Mississauga and Sheridan College. Her studies were specialized in Art and Art History, with a concentration in Sculpture, Photography, and Video. She is currently in the Fashion Techniques and Design Diploma program at George Brown College. Her brand is focused on creating couture art that will give the wearer strength and confidence. From the first look to the last, the audience was enthralled by this striking collection of luxury garments. 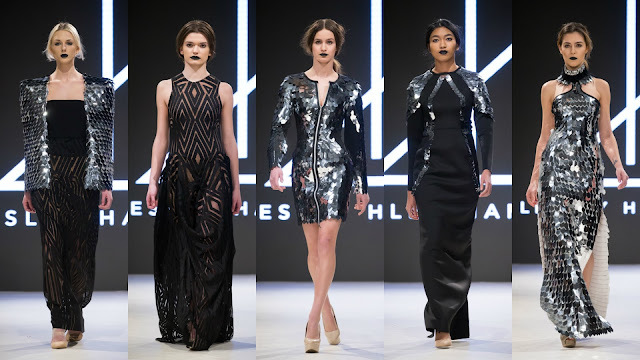 It began a black/sheer geometric fabric lined with beige, moved to solid black silhouettes accented with large metallic silver scales and then all silver garments. My favourite from the collection was the 2nd from the right at the top as it offered a touch of silver, but you could sit more comfortably in it. From the designer, "The Fall/Winter 2016 collection takes inspiration from our designer’s First Nation heritage, exploring the story of the Jingle Dress. Based on the Ojibwe teachings, the Jingle Dress gives strength to the wearer and empowers a community. The collection re-imagines the metalwork used on a tradition jingle dress, with each garment empowering its wearer to become a City Warrior." 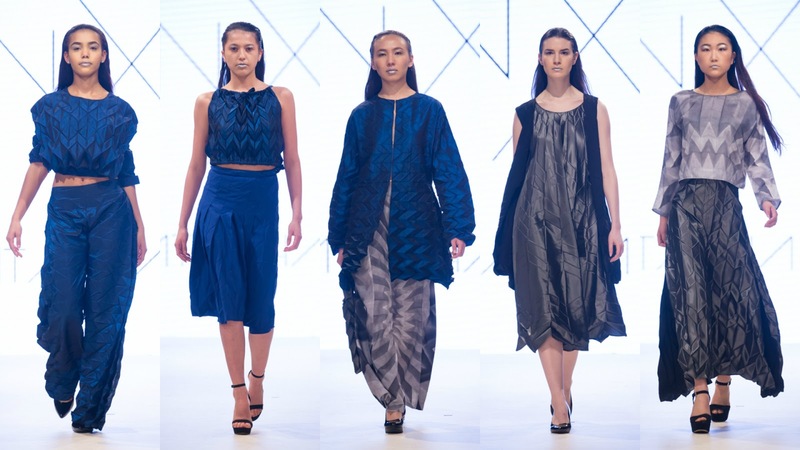 Australian designer Natasha Chiew graduated in 2015 from the University of Technology of Sydney, where she earned a Bachelor of Fashion and Textiles Design (Honours). During her final year, the designer undertook the NSW Business Chamber and was named a finalist. Chiew's womenswear is inspired by the female form as well as her interest in art and architecture. Her F/W 16 collection is called Mercury Rising. Chiew has a talent for offering striking ideas in a subtle way. I loved the dark jewel tone palette and architectural shapes. But the element that took it to the next level was all the geometric pleating she incorporated in each piece. All done by hand. From the designer, "Mercury Rising explores the significance of celestial motifs in Islamic architecture. The collection uses large, sculptural please to replicate the carved Murquanas of mosques and Islamic shrines. 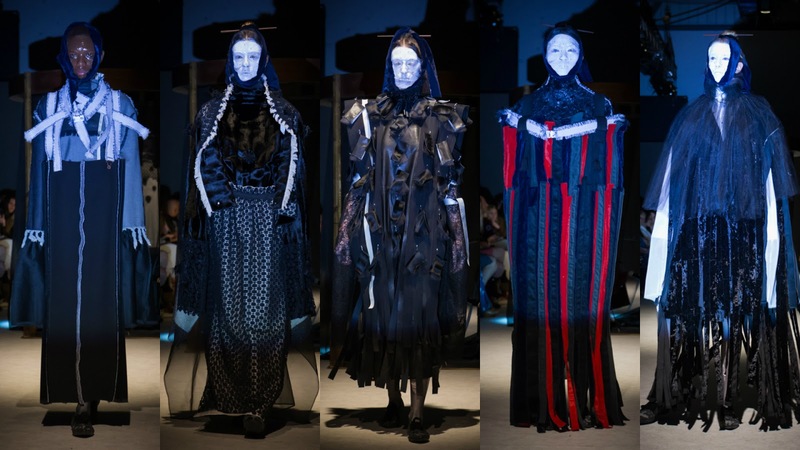 The had folded pleats give form, shape and volume to the garments, and explores the way in which sculpted textile form interacts with the body,"
"The name of the show is #4 project. Actually, there is no inspriation for this collection. The designs come from daily life experience what we saw and felt. There is no sketch on those designs and created from personal interest by brain storming. We also tried to use different fabric and texture to find out the possibility of the hamony of the outfits. Our brand established based on us who are brother and sisters and we would like people to know about out brand as a group rather than just a designer. At the same time, we do not want people only focus on the outfit, but more they can feel the impression and atmosphere. That is almost what we are. It was so glad to meet you last night and let me know if you would like to know more. Thank you. Kathrina"
After watching so many shows, one looks to be inspired by something out of the box. This was a well-presented conceptual show. Fashion as performance art is not new. When it is done well like this show last night, it truly takes your breath away. A circular structure with black sheer drapes was placed mid-runway. Inside a classical cellist was seated. The room was kept quite dark with just spotlights illuminating the runway. The cellist set the tone with her opening notes and provided the musical mood for the models as they slowly traversed the runway. I hope a video of this performance becomes available that I can share as the photos by themselves can only offer a faint hint of the impact of this show. KUDOS to whoever was behind the concept and creation of this performance. I was awestruck!